As I write, sitting in my bunk watching the sun set over the estuary, its 8 15 pm on New Years Eve. Traditionally a time of good wishes to all, a time for making resolutions about what will or will not be happening next year, a time for family and friends and a time for reflection. To be sure its only another marker on an artificial calendar, but it’s a useful marker, one that is close to the longest day of the year where I live and the shortest where a lot of my friends live. It’s a time when we get holiday breaks, some of which have theist backgrounds, some that are pagan but its still the end of year break. Its also a time when advice tends to be handed out, much of which causes me to look at the advisor and think, you should take your own advice buddy and if you did you’d be better off than you are, but occasionally there is a gem. Heres one that I heard yesterday. That’s good advice, a bit wordy though. I’d put it thus--- “Get yourself a mouthful of lifes good things, but don’t bite off more than you can chew”. All the very best to everyone for 2016. Made the spars for SEI today. The spars for SEI are simple rectangular sections with rounded corners, sure they're tapered but only in one plane. Easy stuff. I’ve already got the mast done fiberglassed with a glass sleeve material from Duckworksmagazine and painted, it just needs a leather piece around it where it goes through the partners and the fittings for lazyjacks and halyard bolted thereon. So now its time to make the yard and boom. Yes I know, “Boom” is a noise used for starting yacht races, English is a wonderful language isnt it. I’d a piece of Fijian Kauri, nice wood, this one seasoned for several years in my stack of interesting and useful pieces of wood, so it can be relied upon to be stable and not warp. Agathis Vitensis is an easy wood to work , not quite as strong as New Zealand Kauri but slightly lighter in weight, both are stable, both strong for their weight. First job, the piece I had was 50 x 250, ( two by ten) by 4m, (just over 13 ft) which is plenty long enough for that job. The “Long Steps” build is not far off getting serious and I’ll be needing stringers, so while sawing the lengths for the SEI spars I cut the rest into 25 x 32 stringers for that project. When scarfed up that will give me four stringers long enough for the lower ones on LS. The two pieces on the right are the boom on the right, the yard on its left. The pieces cut from the ends will come in handy somewhere in the next build, you'd be suprised at how much wood you can soak up in small pieces when making up cleat stock and grounds for frames and seating. The rest will be stringers for Long Steps, I'll need about three times whats there but its a start. Having cut the blanks for SEIs spars, I then used the lovely Leuco sawblade I have in the sawbench as a planer to take the roughsawn grain off, it leaves a near planed finish, beautiful and much easier than dragging the thickness planer out and making a heap of shavings ( note to self, fix up the old single phase dust extractor system and bring it up to this shed, it’s a pain in the low back region having to manually clear the sawdust from within the saw cabinet). That done, the spar blanks down to dimension, I marked out the tapers on both, and cut those on the saw. You don’t get quite the same finish when cutting freehand in comparison to running along the fence so I clamped the blanks to the bench and hand planed them smooth. Note the Record number 5 plane, the longer the plane the straighter it will make the work. Note, I cut the taper from the near end toward the middle of the spar blank, dont try it the other way. The sawbench by the way is an MBS 250. These are sold under various brand names but always have the serial number plate marked MBS 250 or 300. I get to work on sawbenches among other woodworking machinery, and these are the BEST I've come across and that includes the European and USA built ones, I'll do a review on it soon. Out comes the elbow grease powered planer, in this case a Record number 5 of about 1930s vintage, very good tool. Having done that, out came the old Ryobi Router I inherited from my elderly joiner uncle, it’s a beauty, heavy, simple, robust and way better than anything that Ryobi make today. With a 12mm radius bit I ran along all the corners of both, then got the sander out. Rounding the corners off, the router makes the job very easy but I am always seriously careful with them, they bite. Measure, mark length and trim. It pays to leave the pieces a little over length until you are in the last stages of finishing. The saw is a Japanese Razor saw from Duckworks, I'd be lost without it. With 120 grit paper and a soft pad on the old Bosch PEX 125 random orbital sander set on slow, I went along and sanded the ends rounded then took out any defects along the full length of the spars. A couple of places had faint sawmarks still showing and my hand planing had left a couple of visible marks which the sander coped with in short order. With that done I hand sanded the two with 240 grit, laid them out on stickers and after a wipe with a tack rag gave them their first coat of varnish. Varnished, they will get another two coats tomorrow. I'm using an exterior grade spirit based satin finish varnish, I'll be able to tell you how it lasts in a year or two. Two more coats of varnish then I can put the leathering on, and the fittings, lace the sail on and we’re getting close to sailing. Christmas greetings and a couple of other things. With Christmas still happening in many parts of the world, I'd like to wish everyone all the best for the festive season and a happy new year. Advertising, this blog is running at about 10K page views a month, thats astonishingly good, thanks all who are interested enough to come and read. But its attracting increasing numbers of people posting advertising, anyone wishing to do that should first contact me so I can vet for appropriate content and work out what its worth, or I'll pounce on each post with the delete button. Too many, or off subject ads are a distraction that we don't have to put up with. Me? I'll be bathing the dog, he found some interesting things to roll in while we were out for a walk yesterday, then I'll be using my new sawbench to make the boom and yard for SEI. I want to be out sailing her very soon and will report as I get on with that project. So all the best from summertime in NZ, its a near perfect morning here with the temp at about 20 deg C and rising, perfectly calm and clear weather and its looking like a perfect day. Trekkies will know this one "Live long and prosper". I called in on Annie Hill today, in part because I was in the area for an engineering job and wanted a break before I drove the 2 hours or so home, in part because she and her friend Marcus are always good to visit, and in part because I wanted to see how she is going with building her new ( junk rigged of course ) home . Chopping a rebate in a floor timber, she's more accurate than I am, I do that with a multitool and fill the gaps with epoxy! Bow view of Siblem, there is not a lot of indication of the real shape as yet, but it will come. She’s got the bukheads made and stood up, the daggerboard cases built and the insides glassed, they’re stood up and fastened in place, and she’s working on the notching for the stringers and some additional floor timbers to take the keel bolts. View from aft, there is another frame to add 500mm aft of what you can see, its the transom and the twin skegs mount between there and the bulkhead you can see, the cutout visible is the motor mount. An outboard, inboard, so to speak. LOTS of space in that boat for a 26 footer. For Annie this is a learning process, her other builds will have been as a helper to a skilled builder so here she is, 60 years old and busy learning how to do it so she can have a little ship that’s truly her own. Go girl! Her “Fantail” has been sold by the way, so now she’s really committed! So why build a new boat? One, there is a lot of thin water around New Zealand, and when you live on a very small income, you need to moor in the places that no one else sees as valuable, that plus they’re often the really interesting places anyway. That plus this boat has been designed to suit her proportions, she’ll be able to see over the cabin top out of the cockpit when sitting down for example. Oh yes, and at 60 years old, looking to live on board for the rest of her days, she said “ I don’t want to die on a boat made of frozen snot” ( fiberglass as L Francis Herreshoff described it). The boats name, at this stage anyway, is “Siblem” that’s an acronym for “Small is beautiful, less is more”. She says that the name might change, but that’s very much the philosophy. I helped for a little while, just a took a few shavings out of a rebate with a chisel, so I’m now a member of the “Siblem club!” There arent many of us. Very exclusive you know! In reality I’m priveledged. I plan to visit every month or so, will keep you posted. One more thing, Marcus has a junk rigged, cabin version of a Portland Pudgy sailing lifeboat for sale, I should have pics in a few days ( reminder to Marcus, hear that Marcus!). If anyones interested in a cheap but very interesting mini mini cruiser give me a shout. She's in Whangarei New Zealand. A subscription wont break your bank and you'll get exceptional value for money. There is a good team of contributors and an enthusiastic and knowledgeable editor so its going to be a good read. Its on topic for us small boat fans, this deserves support. ( Plus its cheap while this deal is running). 50% off Digital Subscription for 2016! Life is full of adventures, you can share this one. For as long as I’ve known him, and that’s a good 25 years or so, Howard Rice has been working on setting out on an adventure that would define his life. He’s had adventures that top anything that most people have ever had but his sights are high and his ambitions large. Read on, and follow the team as we help Howard. While not everyone can sit alongside him in the boat, we can all of us experience the highs and lows of this voyage of exploration through the video that will be made from his cameras. Support is needed, please help us get what will be an amazing story out there for all to share. Check out the link below for details on that. Here's "Southern Cross" near complete, being fitted out at SCAMP Camp Michigan this last summer. As I write she's about to be launched for test sailing her gaff ketch rig tried for balance and her many systems tested. Me? I designed the boat, it’s a SCAMP, with changes to suit the environment into which it will be venturing, I’ve a Kiwi sponsor who prefers to be anonymous, who’s covered my airfare to Chile from here. This means I can support Howard and help prepare the boat (thanks so much, I could not have even considered it without that help). Sailing a boat of my own design in the Straights of Magellan was not on my list of possible adventures, but its going to happen. Life is full of suprises! Here is the press release from Lutra Productions who will be making the “movie”. Announcing “Below 40 South” a documentary being filmed about a solo voyage of exploration in a 12 foot sailboat through Tierra del Fuego and into the Southern Ocean. Lutra Productions is pleased to announce we will be producing a documentary film of footage shot by solo sailor Howard Rice as he explores the remote, dangerous and staggeringly beautiful Tierra del Fuego in southern Chile. Howard has built the wooden sailboat he will explore in (A highly modified Small Craft Advisor magazine SCAMP design) and aboard this boat cameras will be mounted to record a daily video diary of his adventures below 40 degrees south. In February 2016 sailor and explorer Howard Rice will attempt to voyage south on the Straits of Magellan and out into the Southern Ocean to explore the remote southwest islands of Tierra del Fuego. Howard Rice sailed the eastern part of the Beagle Channel and south rounding Cape Horn in a fifteen foot wood canvas sailing canoe in 1990. He returns to explore further. His voyage began with the construction of the boat he will sail and Lutra Productions has documented portions of the build to incorporate into the planned film “Below 40 South, A Voyage To The Dark Side Of The Moon.” Rice’s actual voyage begins in January 2016 on arrival of the crated boat in Punta Arenas, Chile. Rice and the boats designer New Zealander John Welsford will test sail the boat on the wind swept waters of the Straits of Magellan. Lutra Productions will be there to film the launch and test sailing before Rice sets off alone south into the wilderness of Tierra del Fuego and the storm wracked Southern Ocean. There will be no support boat and no film crew following him. He is sailing solo, unsponsored and will be operating a range of small GoPro cameras to record this amazing and historic small boat voyage. Some men and women may choose to cross oceans in small boats but all sailors know near shore navigating is by far the most hazardous, Tierra del Fuego below 40 south is considered the most dangerous ocean environment in the world and is home of the infamous Cape Horn. Rice will have one year of opportunity to explore the region but hopes to conclude his voyage within six months of his departure unless more time is needed. 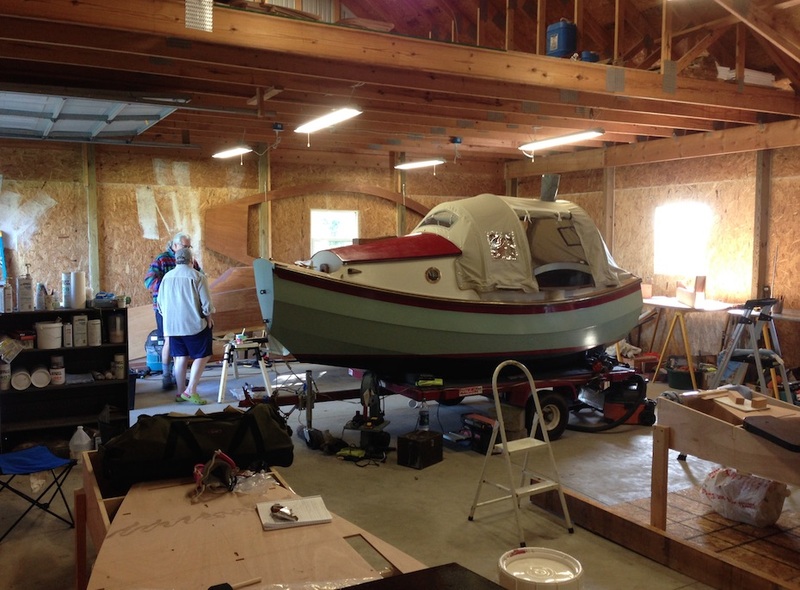 The southern winter begins in May and Rice has equipped his 12 foot boat with a wood stove should he need it for warmth and is prepared to sail in winter if needed. We invite you to contact us to learn more about the plans for the production of the documentary and how supporters can become part of the film production effort. To learn more about Howard Rice’s amazing small boat adventure you can contact either Small Craft Advisor Magazine or Lutra Productions or go to www.below40south.com the official website of the film.